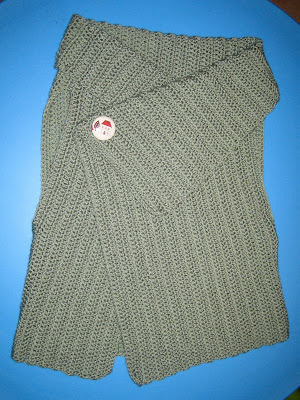 I am so excited to share this completed wrap vest with you. I love it, I totally love it. I do apologise for the dark photos, however I could not wait til daylight to share this. I will take photos tomorrow when I wear it. I am currently in my jammies, *giggle* and well you know, the colours so totally don't match. Besides, I just couldn't submit you to photos of me in my snuggly jammies. You will notice compared to here, here, and here, my collar is, well, rather large. I did plan for this in my casting on as I really feel the cold across the back of my shoulders and my neck. This turned out just perfect for me. Also I have constructed my front panels a little differently to those linked above. 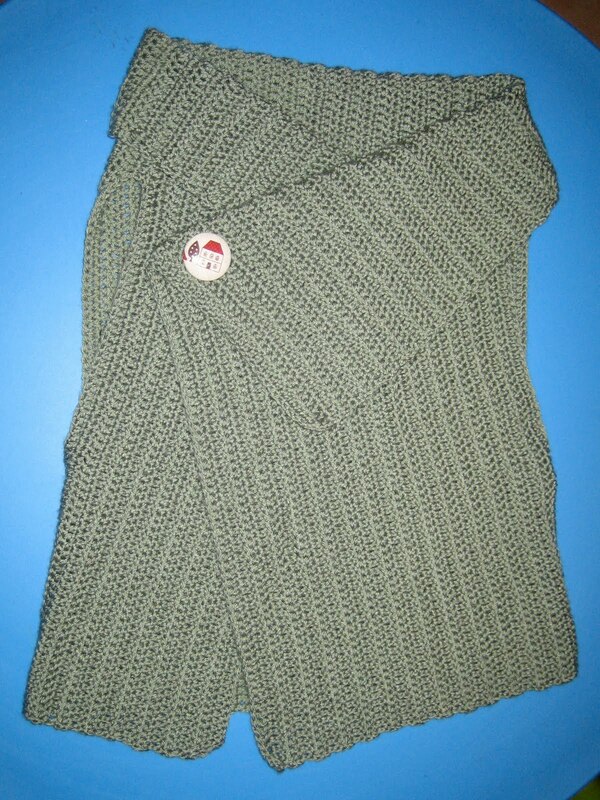 The overlapping top panel is quite wide and pretty much reaches across my body to almost the opposite sleeve opening. The panel below it, comes almost to the middle of my chest. I have a largish bust for my frame, so didn't want too much emphasis 'there'. I also like the slightly off-centre diagonal look as well. 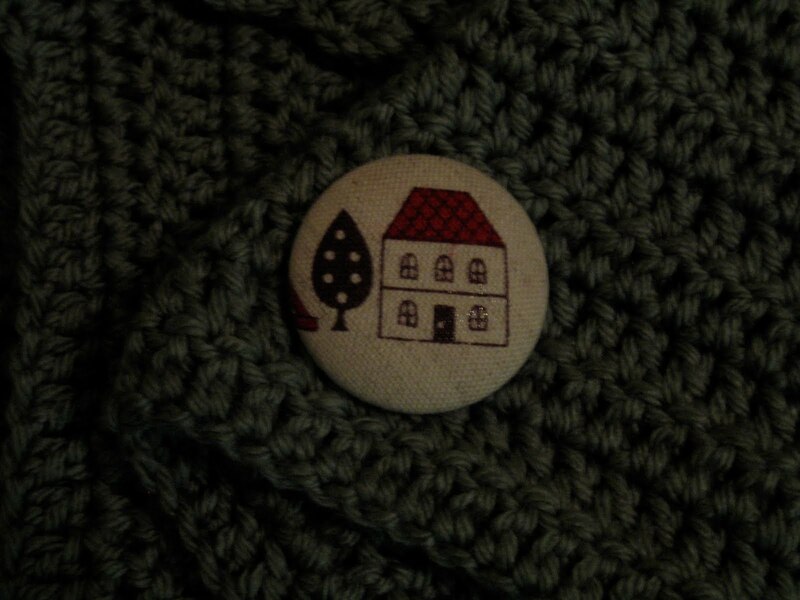 Oh, you like my button?? Yes?? I thought you would, and you can get yourself this button and many more if you visit my new friend Rosie. 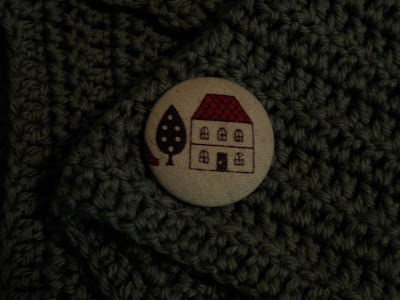 She is into some sewing at the moment, but drop her a line and I am sure she will share her beautiful buttons with you too. Another project down and many more to hook on. Oh and by the way, I am going to make another of these vests, but first, leg warmers, beanies, and fingerless gloves for me. Yes, truly, I did say leg warmers. Tomorrow I will post pics of my wrap vest, and with permission from the very talented Leonie, will ask her permission if I may share my version of her very simple, but WOW wrap vest. Did you manage to finish a project recently and how much do you love it? Was it a gift for you, or for someone you heart dearly? Awwwww...thanks. It's so nice when you connect with people through blogs....such a welcoming community. I love the wrap vest...great Winter colour.